Last month Tammy Duckworth made history, becoming the first U.S. senator to cast a vote on the Senate floor with a baby in her arms. It took some doing; the Senate first had to change a longstanding rule that prohibited babies on the floor of the Senate, and changing Senate rules doesn’t happen easily. Duckworth and others worked for months to change the rule, answering questions like whether this would mean diapers could be changed on the Senate floor, or whether the baby would have to adhere to the Senate dress code. Ultimately, though, the rule was changed to allow senators to bring their newborns onto the floor and even to breastfeed them if needed. And so Tammy Duckworth, U.S. Senator and mom, cast a vote with her child right there with her. Of course, the news media covered the moment with enthusiasm for its rarity. It was a rare moment in large part because of the limited number of women who have exercised privileges on the floor of the United States Senate. In the history of the body, only fifty-two women have been members; twenty-three of them serve today, an all-time high. So the sight of Senator Duckworth bringing her baby into the Senate was a symbol of the way tradition has been forced to evolve under the pressures of gender equity. But beyond the celebration of justice and progress, I was struck by the power in the juxtaposition—one individual holding together in a single moment four distinct identities: woman, veteran, political leader, mother. And the infiltration of mothering, with all of the connotations it brings—nurture, protection, love, sacrifice—into a body that frankly is regarded by many Americans as mired in futility, impotence, and destructiveness, spoke a word of prophetic protest to politics as usual. Insisting on bringing her young child to the halls of government, Duckworth did more than demand workplace accommodations. She offered a display of mothering as an act of resistance to disordered power. Many of us have had similar conversations; some of us have had them with ourselves. We’re not always sure we buy all of the things read and mentioned and claimed here at church. What do we do with the disconnect between the assertions of the faith and the requirements of the critical mind? Can you be a Christian misanthrope? The Merriam-Webster Dictionary defines a misanthrope as “a person who hates or distrusts humankind.” Precisely used, the term refers to someone who retreats from human interaction out of a rejection of human community. Understood as such, it should be pretty clear that you can’t be a Christian misanthrope, for that’s a contradiction in terms. Christianity’s emphases on love and community make our faith tradition obviously incompatible with someone who would declare that he is done with humanity. So I will admit that the phrase “Christian misanthrope” is a bit of intentional literary exaggeration, an oxymoron meant to grab attention. But I also use the term because I have been called a misanthrope from time to time—kiddingly, I hope, by friends who know my strong preference for alone time and independence. Even to call it a “strong preference” seems an understatement. I often tell people that when I underwent my psychological evaluation for ordination to ministry, my tests concluded that if I were any more introverted, I would quite simply be dead. My default is to be alone; it requires intention for me to seek out the company of other people. I like quiet; I often prefer time to talk to myself over talking with others. A good weekend to me is spent walking in the woods behind my house, sitting on my porch staring at the deer in the field across the way, or tinkering with a project in my garage. My Pentecostal-leaning grandmother knew a good preacher when she saw one. Modeled after the televangelists with whom she spent much of her time, her standard for a good preacher was one who just “preached the Word,” spontaneously and extemporaneously, not with a sermon crafted in the week before but in a heartfelt connection with the Bible that lived from the moment. Good preachers, she would say, prayed the same way. A good prayer isn’t written out; it comes from the heart—spontaneously, with words that come directly from the Spirit in that moment. When I was in college, the campus chapter of Intervarsity Christian Fellowship was my main community of friends, and there too the evangelical model of prayer was consistently lifted up and practiced. Good prayer was heartfelt, personal, spoken in the moment, with a generous use of the word “just” that I never quite understood—as in “Jesus, we just thank you for your love.” Good prayer finds its expression in the moment and from the heart. Then I went to seminary and discovered a number of things, including that on the topic of prayer and worship, I was a closet Catholic. Or so it seemed, because I fell in love with another kind of liturgy and prayer. In seminary I discovered prayers that are old, standardized, and passed down from one generation to another. I discovered the Episcopal Book of Common Prayer and the Presbyterian Book of Common Worship, chock-full of prepared prayers that were used in common in many different places and many different times. I learned the art of crafting prayers carefully, ahead of time, with attention to language more like poetry than conversation. Prepared, shared, standardized prayer became authentic and good to me. The president is at it again. This week, in a White House meeting on immigration reform, and just days before the celebration of Martin Luther King Jr. Day, Mr. Trump apparently let loose with disparaging comments about Haiti and various African nations suffering from natural disasters, poverty, or underdevelopment. He called them “shithole” countries, and he wondered aloud why we should want to invite immigrants from those places, instead of from places like Norway. The comments, confirmed by both Democrats and Republicans in the room, exhibit clear racial undertones, and they continued Mr. Trump’s tendency toward racially ignorant public rhetoric (think Mexican rapists and the “good people” he assumed to be among the white supremacists in Charlottesville). Rather than serving the cause of unity, the president’s remarks further stoked the racial antagonism and injustice that is our national crisis. For the past decade, I have been writing and speaking about the need for more civility among American leaders and citizens. I define civility as the exercise of patience, humility, integrity, and mutual respect in public life, even (or especially) with those with whom we disagree. Civility is a set of virtues that we need to actively cultivate in each other, in our relationships and our civic institutions, as the public ethos that guarantees the health and effectiveness of democratic politics. 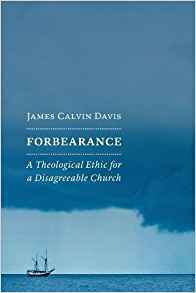 (My most recent book argues for a Christian version of these norms that I call forbearance.) Without this commitment to open and constructive dialogue, rooted in a genuine respect for others as fellow participants in public life, the future of democracy looks grim. What’s in a name? When I was in seminary, my middle name understandably got a lot of attention. Professors and students alike at the Presbyterian school I attended got a kick out of a guy named James Calvin Davis in their midst, wondering aloud whether it was foreordained (get it?) that I would be called to ministry with a name like that. The reality is, at least on the surface, much different. I am proud to be named after both of my grandfathers, James Kermit McCullough and Calvin Davis. But the ironic part is that the man who gave me the name that tickles my fellow Presbyterians so much was, in many ways, the opposite of the sixteenth-century churchman—not so much pious and learned as a rough-around-the edges coal miner from which I get both my appreciation for blue-collar values and a legendary Davis temperament. And yet that name of which I am proud has become more to me than just a testament to my grandfather. Without it, I am a generic placeholder; “James Davis” is one level up from “John Doe” on the scale of nondescript monikers. But with it, I am James Calvin Davis, professor and Reformed Christian theologian. James Calvin Davis has become an symbol of who I am, of what I consider myself to be. On December 15, 2017, James Calvin Davis was interviewed by the National Council of Churches for their regular podcast. They discussed Forbearance, the inspiration for the book, and how a recovery of this ethic might help bring about a return to civility in the world beyond the church. You can hear the interview on Stitcher or iTunes.